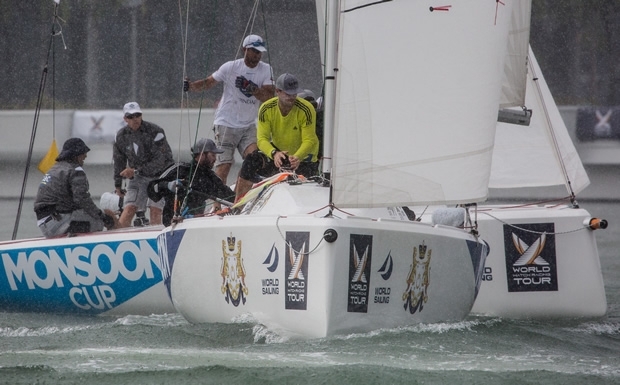 Taylor Canfield dominated the first two days of the Monsoon Cup but today Team GAC Pindar skipper Ian Williams managed to ruin his perfect score with a masterful execution of the start. Whenever the two most recent World Champions of the World Match Racing Tour meet on the race course, there are fireworks, and today produced a typically aggressive dogfight between these two arch-rivals. While the rain may not be to Canfield’s liking, he might have the Malaysian thunder and lightning on his side. At the evening press conference, it seemed that every time Canfield went near the microphone there was a whip crack of thunder, as if the noise of the hard rain wasn’t loud enough already. The next two days will reveal whether this is a good or bad omen for US One. The wildly variable conditions made it impossible to complete all 22 flights of Qualifying as scheduled. Instead there’s an early start on Friday to finish off the final two flights of the stage. A lot could change in those six matches. As ever, there are a number of teams sitting on the cusp of making or missing the final eight for the first knock-out phase, the Quarter Finals. Three teams are definitely out of the competition now: Reuben Corbett (NZL) and the two local skippers, Maxi Soh (SIN) and the new hero of Malaysian sailing, Hazwan Dermawan (MAS). Both local teams acquitted themselves well this week, with Soh beating Johnie Berntsson (SWE) and then beating Hazwan in the local derby match. While Hazwan failed to build on his two victories over Keith Swinton (AUS) and Bjorn Hansen (SWE), his confident and spirited performance has brought great pride to the country. Hazwan hopes this could be the springboard to getting Malaysian teams into the new era of the World Match Racing Tour, which launches in just over a month’s time when the first event in high-speed M32 catamarans takes place in Fremantle, Western Australia. Meanwhile the international battle for the Monsoon Cup goes on, with Kiwi Phil Robertson’s hopes hanging on by a thread. Asked what he’ll do to prepare for his final crucial matches tomorrow, the Kiwi replied with a wink: “Go to bed early, get up late, just like we always do!” With all of Johnie Berntsson’s matches completed, the smiling Swede has to sit and watch the live TV tomorrow and hope that his rivals put together the right combination of wins and losses to see him scrape through to the next round. Swinton, Hansen and Switzerland’s Eric Monnin are not yet home and dry, but one win from their final three matches should see these skippers safely through to the final eight. The two young Danes, Joachim Aschenbrenner and Nicolai Sehested are sailing very impressively, with Sehested’s victory over Williams a real morale boost for the skipper of Trefor Match Racing. After Williams’ and Canfield’s defeats today, none of the remaining teams is looking invincible, especially not in the wildly variable conditions on the Straits of Johor. Luck, as well as skill, could play its part in the outcome of the Monsoon Cup.